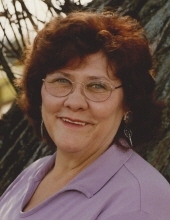 JoAnn M. Steffes, age 75, passed away at home on Tuesday, March 19, 2019. She was born on August 21, 1943 to Robert and Evelyn (Keiffer) Thiele. JoAnn got an associate’s degree in business and worked part of her career as a secretary. The majority of her career, she worked as a cook for multiple different businesses. She also enjoyed cooking, canning, gardening, rummaging, and going to trading posts in her free time. On June 23, 1979, JoAnn married Joseph Steffes in Brillion, WI. Much of their free time was spent with the family, traveling and camping. JoAnn enjoyed spending time doing bead work and had a great love of jewelry. She loved her ’71 Ford LTD convertible and going to old car shows. She also treasured her dog, Pepe. JoAnn is survived by her husband, Joseph; mother, Evelyn; children: Fawn Steffes, Steve Kools, Scott Kools, Ronnie Steffes, Curtis Steffes, Danny (April) Steffes, Theodore Steffes, and Tom Steffes; 35 grandchildren; and nine great-grandchildren. She is further survived by brothers: Dan (Pam) Thiele, Kenny (Mary) Thiele, and Jerry (Corrie) Thiele; and numerous nieces, nephews, other relatives and friends. There will be a visitation held for JoAnn on Saturday, April 6, 2019 from 11 a.m. until 3 p.m. at RYAN FUNERAL HOME, 305 N. 10th ST. De Pere, with a service to follow at 3 p.m. The family would like to give a special thank you to all of their friends and family for the support and prayers offered to them in this difficult time. In lieu of flowers, a memorial fund will be established in JoAnn’s name. To send flowers or a remembrance gift to the family of JoAnn M. Steffes, please visit our Tribute Store. "Email Address" would like to share the life celebration of JoAnn M. Steffes. Click on the "link" to go to share a favorite memory or leave a condolence message for the family.